all the people stood up (Nehemiah 8:5). Note the “he,” please. That’s how most folks imagine the ritual of hagbah, lifting the Torah. It’s a guy thing, based on a guy story in a mostly guy text. 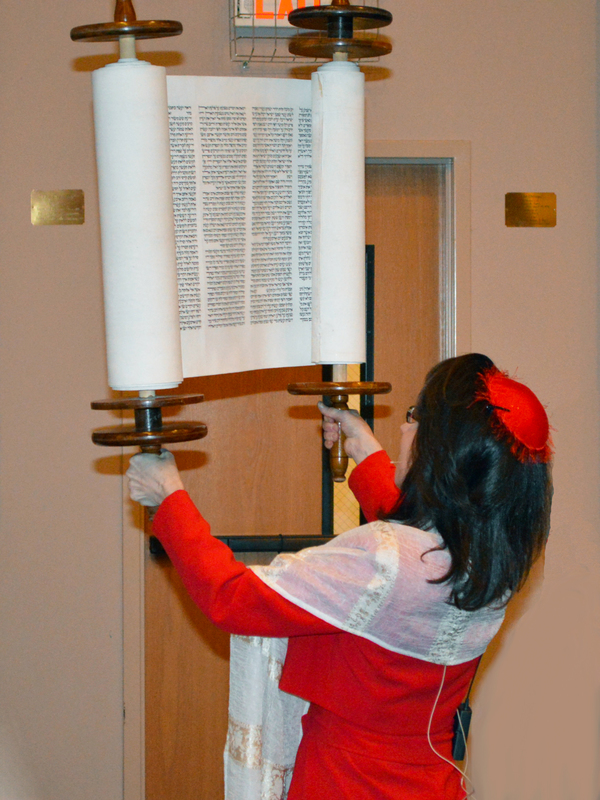 The first (and only) time I saw a woman perform hagbah, I wanted – immediately and badly – to lift a Torah scroll myself. Lori, after all, was just about my size (very small). If she could do it, I thought, so could I. Every year, I vowed to do the weight training, strengthen my skinny arms, and lift the Torah. Every year I’d fail to do the training, regret my lack of time and commitment, and renew the vow. Four years passed. By that time, I’d been diagnosed with osteopenia. I’d been given the wake-up call: Do weight-bearing exercise, take your calcium and magnesium daily, and protect those aging bones. During those same years, our son, Erik, had been increasingly devoting his exercise regimen to strength training. When I bemoaned my failure to get with any program, he created one specially designed for me (and for hagbah). I need only do four specific exercises two times a week at the gym, increase reps and/or weight as I go and, Erik promised me, I would do hagbah within two months. I was devoted to the cause. I reported on my progress to my twenty-one year old personal trainer. The ten pounds I could barely move became twenty, thirty, and thirty-five after eight weeks of training. I was pulling up forty percent of my body weight and it was the time of year when the Torah scroll was near center and relatively balanced on both posts. I was ready to give it a try. “Weak,” my husband Ralf pronounced, as my arms shook. Hagbah, Ashkenazi style, demands that the congregation see three full columns of Torah. 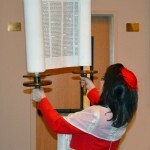 The scroll has to be held high and turned so that everyone in the congregation can see it. Drop the Torah, and everyone present is required to fast during the day for 40 days. A small community has gathered for a Shabbat service. This morning, the rabbi looks around and notes who is in the room. She knows everyone present – who has back problems and who is in ill health, who is mourning, and who is anticipating a life cycle event. This morning, she sees that not a single Jewish person is present who could take on the mitzvah of hagbah. There is one man in the room who would certainly do so, if she asked. He is married to a Jewish woman and has raised both his children Jewishly. He has lived Jewishly for two decades. He attends services regularly, prays alongside his Jewish friends and family, and supports the small congregation wholeheartedly. He happens to be one of the most morally upstanding members of the congregation, and the rabbi has long appreciated his ethical sensibilities and calm nature. Can that man perform the mitzvah of hagbah? It’s a long teshuva, I admit. I wandered through plenty of ancient history and lots of rabbinic writing. In the end, my answer was that halakha permitted the non-Jew to raise the Torah. The fellow in the story has long since joined the tribe officially. He is one of our regulars where hagbah is concerned, and his way of lifting the scroll is extraordinarily beautiful. He turns with confidence, the scroll held securely and firmly overhead. Before services last night, I approached him as he and his wife were setting up for oneg. He gestured to his clothing. “I didn’t really dress for it,” he said. Steve grinned. “You’re going to do it?” he asked. “If I feel I can, I will try,” I said. I gripped the posts. I told myself that my earlier attempt that same afternoon was mere rehearsal. This was for real. I needed to brace myself and be tough. “I will lift you up,” I thought to myself. I wanted everyone to see that a woman could be strong enough for hagbah. The Torah is the repository of gorgeous and frightening stories, loving and harsh law, enigmatic and revelatory narratives. When we lift the Torah, we honor and recognize that we humans are those self-same things – beautiful and scary, tender and cruel. We are carriers of secrets and capable of bringing light. Our Torah is our mirror, and to look into it is to look into ourselves. Black fire on white fire, so the Talmud says. And all colors in between, I think. “I will lift you up,” I thought. I don’t know about the chanting; the lens took all my attention. I do know that our arms are strong enough, no matter how scrawny or brawny or young or old, to lift any burden placed there as long as we are not alone. Oh, what a wonderful story this is! And also, I would love to read your teshuvah, if you would be so kind as to share. I’ve started doing hagbah a new way at my small shul, where we often barely make a minyan on Saturday mornings and where those who attend tend to be unable to do hagbah. I invite someone up, and they hold one of the etzim at both ends. I hold the other, at both ends. We raise the scroll so that it is upright between us, with the etzim vertical like trees, and we move so that we are facing the congregation, with the scroll unrolled to show 3 beautiful columns. And then we close the scroll and the other person sits down and holds the scroll in their lap so we can do g’lilah. Could you please share the weight training program for hagbah?